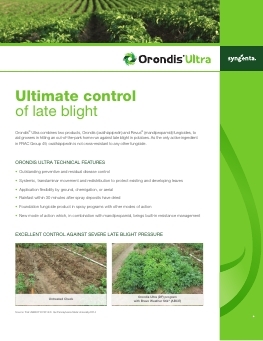 In leafy, brassica and bulb vegetables and other selected crops, Orondis® Ultra fungicide combines two powerful active ingredients with systemic and contact protection to aid growers in hitting an out-of-the-park home run against diseases. 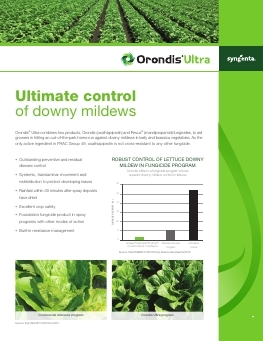 It is a real game changer in controlling downy mildews and other Oomycete diseases, protecting the crop when it is most actively growing to maximize marketable yields. 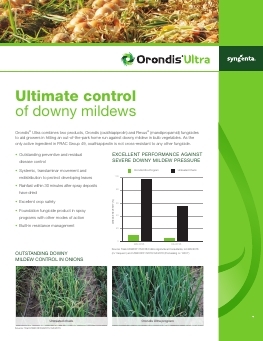 Orondis Ultra offers control you can rely on, making it this season’s Most Valuable Product. 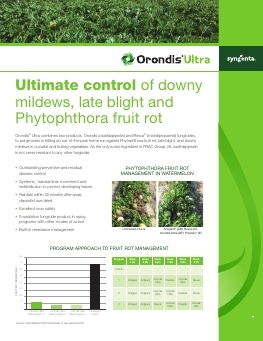 Orondis Ultra combines the proven, trusted performance of mandipropamid (FRAC group 40, the active ingredient in Revus® fungicide) with oxathiapiprolin, which brings a paradigm shift in a.i. use rate compared to other fungicides. In addition to high intrinsic activity, oxathiapiprolin has a novel mode of action and, as the only fungicide in FRAC group 49, is not cross-resistant to any other fungicide. Orondis®, Revus®, the Alliance Frame, the Purpose Icon and the Syngenta logo are trademarks of a Syngenta Group Company.